Strengthen your Beauty. Better health means better skin. 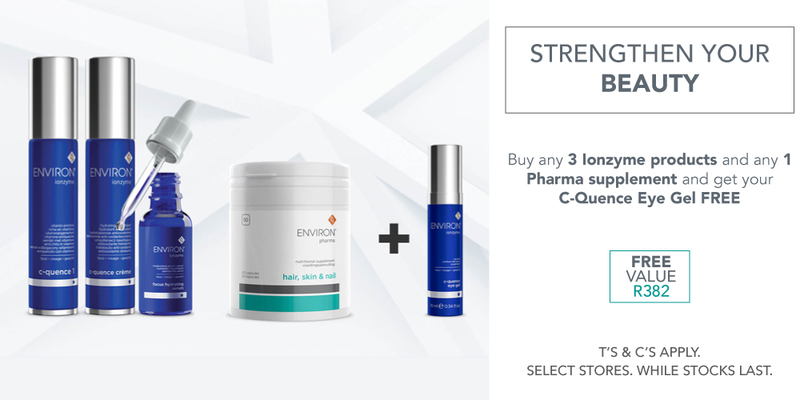 Introducing the new Environ Pharma Supplement Range, which actively supports holistic skin health and wellness. Containing a balanced combination of vitamins, nutrients and antioxidants, the Environ Pharma Supplement Range will assist in strengthening yor skin so that it will look healthier and more radiant. The supplements in our Essential Care offering form the basic building blocks to a healthier looking skin, whilst our Specialist Care range of supplements will give your health and well-being and extra boost. Isn’t it time for you to strengthen your beauty form within? T’s & C’s Apply. Available at selected Sorbet Stores. Valid while stock lasts.